Welcome to Unique Memory Makers. Thank you for visiting Unique Memory Makers. Please come back and see us soon!. 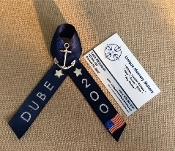 Double colored ribbon to wear to PIR to show your support for you Sailor. 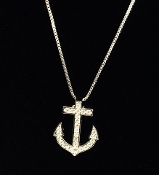 Silver toned Cubic Zirconia Anchor Pendant Necklace. 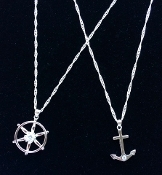 The box chain is 18" long and the anchor pendant is 1.25 inches tall. This necklace is beautiful and pictures do not do the jewelry items justice. This item has FREE Shipping! 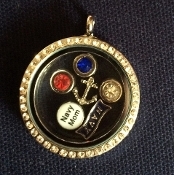 Floating Charm Locket, you choose the charms and locket. This item has FREE Shipping! Gold toned Charm Bracelet with one clear and one blue bead (it looks purple in the photo but it is blue) and two different anchor charms on a bangle type bracelet. This piece is beautiful. The pictures do not do the jewelry items justice. This item has FREE Shipping! Heirloom minky, chinille, fleece baby blankets with name. 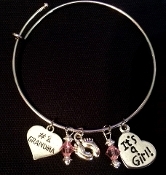 Silver toned Gender Charm Bracelet, It's a Girl or It's a Boy design. 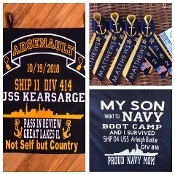 Key Chain made from Heavy fabric in your choice of military branch. 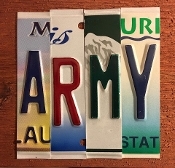 Available with several different colors for letters with several different name/word choices. Luggage Tag made from Heavy fabric in your choice of military branch. 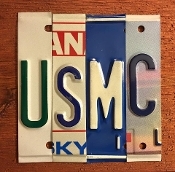 Available with several different colors for letters with several different name/word choices. PIR Door Banner. 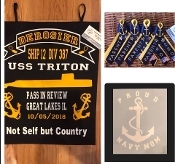 There is no better way to show your pride for your new Sailor!!! Several styles and designs to choose from with your choice of words. Silver toned Charm Bracelet with Navy and Yellow jewels, NAVY charm, Navy Crest Charm, and an anchor charm. This item has FREE Shipping! 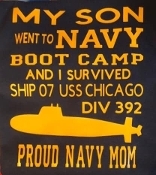 Navy Sea Bee Anchor Charm Bracelet Pearl stretch Bead Bracelets Personalized shirt "I Survived boot camp"
Door Banner or sign made from fabric and iron on letters/numbers/anchor to show your pride for your new Sailor. PIR Banner and 4 PIR ribbons. PIR Banner for 800 divisions. 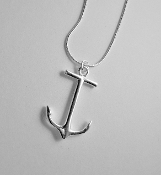 Sterling silver 9.25 necklace 18" long with sterling silver 9.25 anchor charm that is 1.5 inches tall. This piece is beautiful. The pictures do not do the jewelry items justice. This item has FREE Shipping! US Navy License Plate sign USMC License Plate sign Vinyl Printed Shirt "I can't KEEP CALM"
Ribbon to wear to PIR to show your support for you Sailor. 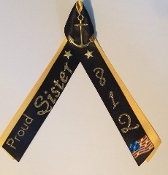 Triple colored ribbon to wear to PIR to show your support for you Sailor. Personalized shirts with DIV and name. 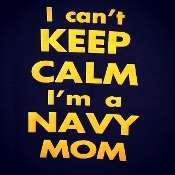 Tee Shirts for the whole family available in several different designs and shirts colors to chose from. Embroidered in bright colors, design is approximately 4in wide and 4in tall. Luggage Tag with Heavyduty Swival Hook. 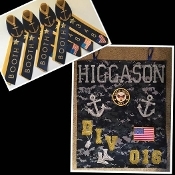 Made from heavy fabric in military camo or solid color choices with coordinating letter colors and name choices. 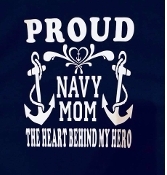 This great design shows your Military Pride and support for your service member. 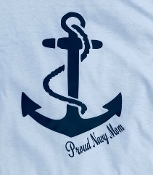 Shirts for Dad embroidered in bright colors, design is approximately 4in wide and 4in tall. 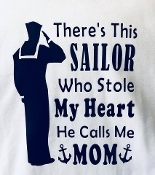 Shirts for mom embroidered in bright colors, design is approximately 4in wide and 4in tall. 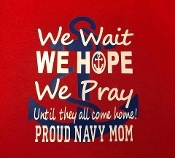 Shirts for Wife embroidered in bright colors, design is approximately 4in wide and 4in tall. 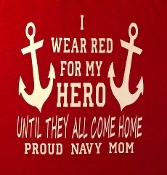 Wear RED on Fridays and show your support for all of our military service members. Vinyl printed two sided HERO shirts in Navy or Red preshrunk cotton. Embroidered shirts for the whole family. 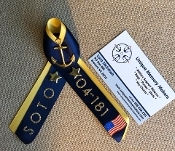 Ribbon to wear to PIR to show your support for you Sailor. Black ribbon with gold accents and letters. This is the ribbon worn by the 800 divisions or Special Op's division. Ribbon to wear on Fridays to show your support for our US Military.